Staff member of the week is Jamie. 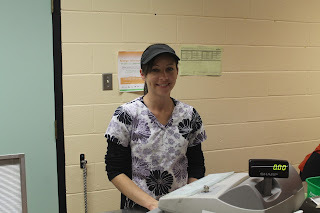 Jamie is a loved staff member here at Blackville School. After school when she goes home she likes to lay back with her feet up and relax. Her favourite type of music is country and her favourite colour is purple. 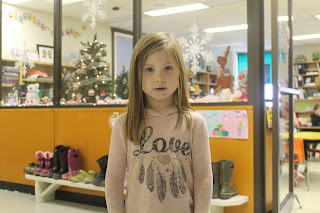 She said that there's nothing in particular that she wants from Santa for Christmas. The teacher of the week is Mrs. Hallihan. 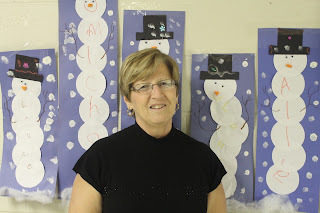 She is a very caring and loving teacher here in our elementary. The students love her as a teacher. After school she enjoys going home and spending lots of time with her grandkids. She also loves good old country music. Her favourite colour is purple, and the only thing she wants for christmas is to be healthy and have fun with family and friends. Kenley Estey is in Mrs. Norton's kindergarten class. Kenley enjoys watching TV and the colour purple. Kenley is a very good hard working student! Kenley asked Santa for makeup for Christmas this year.